How about a cozy cabin with lots of charm? How about a nice deck with a gurgling, bubbling hottub ? How about Becca’s? This quaint little place that’s actually bigger than it seems at first glance is situated out in the country on a shady hillside, not far from Nashville. A cool quarry tile floor, beams, baskets, and a native stone fireplace all add to the rustic ambiance of the 3-bedroom, 1 bath cabin. While the kitchen is compact, there’s plenty of room to attend to the hunger pangs of your crew. A full size refrigerator, gas range, and microwave stand ready to serve. The dining table is close to the kitchen, and adjoins the cozy living room. Cuddle up on the couch in front of the fireplace for some TV time, or challenge your cabin-mates’ skills by playing one of the many board games found on the bookshelves. Snug as a bug in a rug you’ll be when Mr. SandMan comes a-callin’. Take your choice of the upstairs bedrooms and their various sized beds. Goldilocks herself would likely want to try the four-poster queen sized bed in the loft bedroom, which overlooks the living room. Next, she might want to experience the cozy comfort of the double bed tucked into a tidy little corner of bedroom number two. Lastly, little Goldi could even have a friend over if she decides to sleep in bedroom number three, where she will find a couple of sweet twin beds dressed in cute quilts, ready for whispers and giggles till the wee hours. Childhood memories will be made as your happy little campers play in Becca’s tree-house, and sing songs while swinging in the pair of swings nearby. 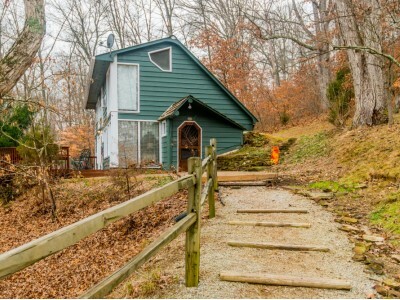 Steps leading from the deck to the yard, stone pathways, rail fences and lots of pretty plants all combine to make a rather enchanted setting for anyone who chooses Becca’s cabin for their Brown County getaway. The unique little village of Story is just down the road a bit, and Brown County State Park is practically at your back door. Horseback riding, ATV tours, paintball, and zip-lining are other outdoor activities that are just minutes from your cabin, if you happen to be seeking an activity that gets your adrenalin pumping. Call the friendly staff at Hills O’ Brown Vacation Rentals, or go online to make your reservation for Becca’s, and get more info on the many fun things to do while you’re here.